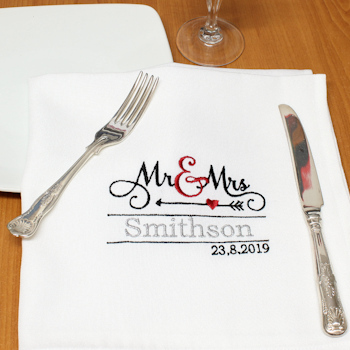 Mr and Mrs personalised white cloth dinner napkin that can be personalised with embroidered surname and wedding date. Quality smooth polyester table napkins with luxury feel approximately 47cm square with running stitch hems. The name is completed in a metallic silver thread for that appearance. Quality smooth polyester table napkins with luxury feel approximately 47cm square with running stitch hems. The name is completed in a metallic silver thread for that appearance. Optional to have a numerical date personalised under the surname. Select from a Single Napkin or a Pair of Two Napkins. The epitome of luxury dining, this cloth napkin is a lovely keepsake momento gift. Fantastic for weddings, anniversaries, Valentine gifts and other special occasions.